Bluebells are generally showing off from early or mid-April to the end of May, hanging out in old woodland and on bracken-covered hills. 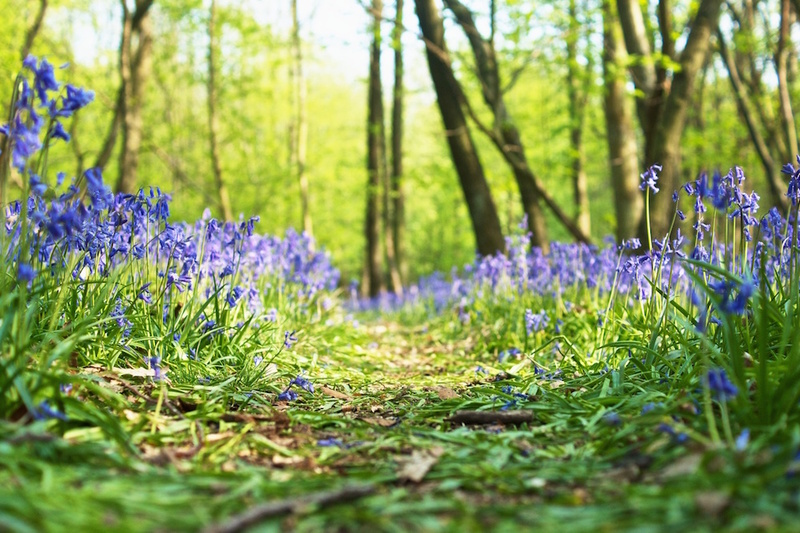 We have several top spots to catch them in the county, below are some of the best bluebell walks in Sussex. Just check the blue stars are out before you visit. The most famous of Sussex bluebell spots is the Arlington walk that has been around since 1972 and now incorporates seven trails over three farms, one of the routes wheelchair accessible. In its 47th year, it is open from Thurs 11 April every day 10.00 to 17.00 until Sun 9 May. The website gives you ‘status updates’ of how the flowers are doing. 23 charities are involved providing refreshments. There’s also the opportunity to watch cows being milked from a viewing gallery at Parkwood Farm in the afternoons. In the area: The on site Farmhouse Kitchen has cookery courses on certain dates. Nearby pub The Sussex Ox has a large garden and food supplied by its own organic farm. Fine dine at the Tasting Room at lovely lofty Rathfinny Estate in Alfriston or pretty Wingrove House in the same village. Drusillas is nearby for family fun. In the same area as Arlington Bluebell Walk, this ancient woodland is named because it was once overseen by the Abbott at Battle Abbey. As if you needed an extra reason to visit this wonderful outdoor art gallery, which reopens for 2019 on 31 March, bluebells can be seen in the woodland here around the exhibits. In the area: Team your trip with lunch very nearby at Goodwood’s quirky and locally supplied Farmer, Butcher, Chef restaurant, particularly if you’re a meat lover. Kipling’s former home, now a National Trust property, is surrounded by Sussex Weald Woodland where you can hunt for the carpets of blue. There’s a guided Iron Pits and Wildflowers walk on Fri 26 April incorporating the history of the area. In the area: You could eat at characterful The Bell at Ticehurst, which also has quirky rooms for staying over, or, treat yourself to fine dining at The Curlew nearby. For lingering and self catering in the Weald see The Lodges at New House Farm which also have woodland on their doorstep. 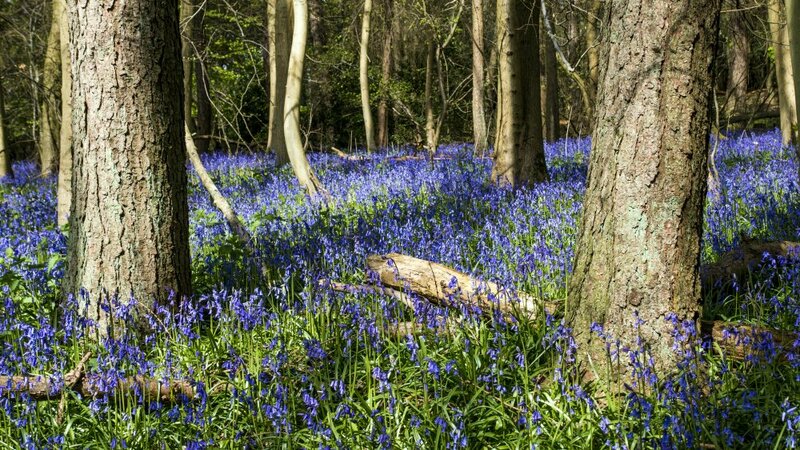 The woodland surrounding Angmering Park Estate, between Worthing and Arundel, dates back to the Norman Conquest and has one of the best bluebell displays in West Sussex. You may also spot highland cattle. In the area: For teas, lunches, homebaked bread and cakes, The Artisan Bakehouse is around 20 mins north at Ashurst, or for casual eats by the sea, try the West Beach Cafe at Littlehampton. One of the earliest yew woodlands in Western Europe, Kingly Vale near Chichester has some fantastic ancient twisted trees that look like they belong in Lord of the Rings – in fact they’re among the oldest living things in England. There are also bluebell carpets here in Spring – follow the network of walking paths in the nature reserve. In the area: The Goodwood Estate (see above) and Muddy award-winning The Earl of March are among good places to eat nearby and the seafood focused Crab & Lobster at Siddlesham is under half an hour. With children? Combine with the vintage attractions of outdoorsy Amberley Museum or Arundel WWT wetland centre. You don’t even need to walk for this one. You can catch sight of the blue carpets that gave the vintage railway its name as you travel between Sheffield Park Station and East Grinstead. Various services are available from a standard ticket to ride, to lunch aboard the Sussex Belle on 24 April. In the area: Great British Wine Tours has vineyard tours which include Bluebell Vineyard Estates on various dates in April and beyond, with departures from Brighton. It also offers gift vouchers linking vineyard tours with the Bluebell Railway. The aptly named Walk Wood at Sheffield Park reopened in 2017 following a 15 year restoration project which recreated a network of paths from the early 1700s. This is one of the best places on the site to see bluebells but you’ll also catch them in the gardens and on other walks. 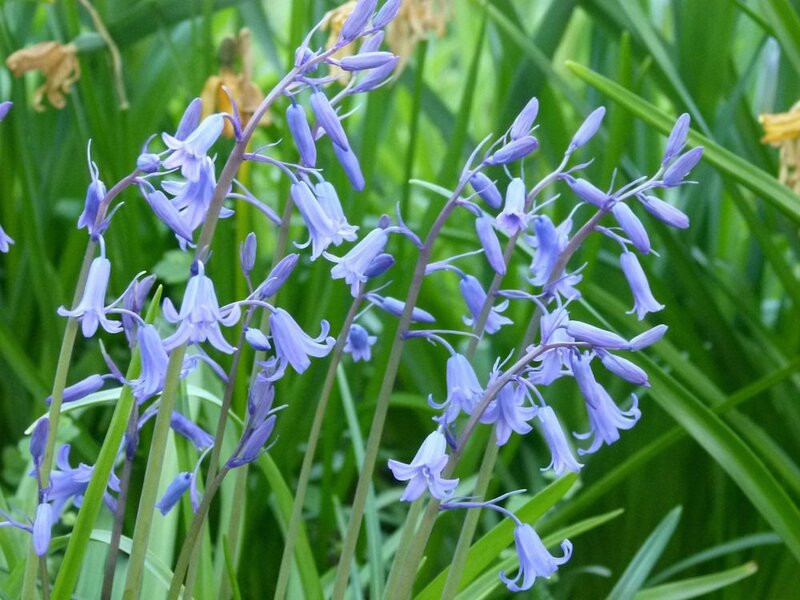 There are guided bluebell walks on 23 and 30 April. In the area: For a double dose of flower power, combine with the nearby Bluebell Railway above. Characterful foodie pub The Cat Inn is not far away at West Hoathly, you can also stay over in smart rooms here. Another National Trust property. The woodland and the wild garden at Nymans are carpeted with bluebells. In the gardens around the historic house you can also see the magnificent magnolias. There’s an art workshop in the bluebell woods on Thurs 25 April. In the area: Nymans is within 20 mins of The Cat Inn – see above, and the Snowdrop Inn at Lindfield. This compact four acre contemporary country garden was designed by John Brookes MBE, who was influential in popularising the concept of the ‘outdoor room’. Bluebells are among the blooms you’ll see there this spring. 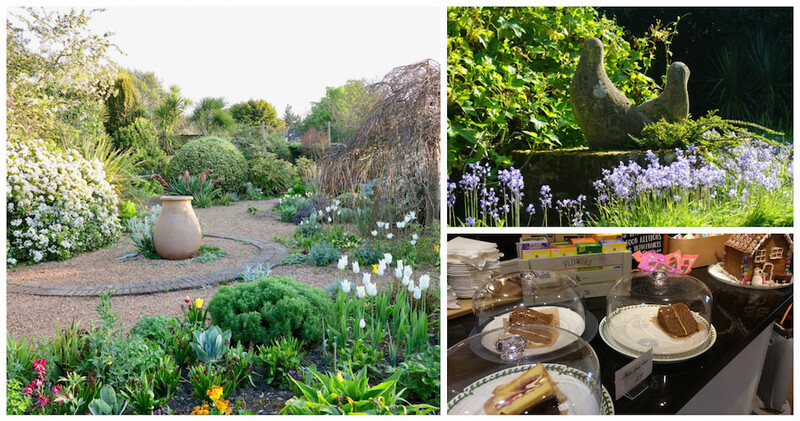 In the area: Denmans itself has a lovely cafe in a conservatory-style building where you can tuck into cake, lunch or afternoon tea. Fontwell Park racecourse is right next door, with family-friendly events this Easter. Arundel is not far away. Around 20 of the 100 acres of the original Standen Estate should be bluebell-tastic this spring with Rockinghill and Hollybush woods carpeted. Purple orchids usually bloom in Hollybush to add to the magic and you may also catch the tulips flowering around the house and gardens. You can walk from Standen to the Bluebell Railway at Kingscote Station. The Standen House itself is an Arts and Crafts family home with interiors by Morris & Co. In the area: The Dorset Arms, at Withyham, where the menu features organic meat supplied by its own estate, is within 20 minutes and on the edge of Ashdown Forest for further exploration. It also has a cottage for weekending. This varied ancient wooded area, now a Sussex Wildlife Trust nature reserve, incorporates ponds, streams, meadows and reclaimed arable land. Besides bluebells you may see wild orchids, purple emperor butterlies and ponies that help to keep the grass grazed. The common is about five miles north of Petworth and there’s a car park at Ebernoe Church. The Mens nature reserve (note, no apostrophe – women are welcome!) is another bluebell spot near Petworth. In the area: Gastropub with rooms The Halfway Bridge is nearby, right on the A272. Ancient and secondary woodland and open heathland combine at this spot in the High Weald Area of Outstanding Natural Beauty. The woods are to the north east of Powdermill Reservoir so you can combine bluebell spotting with waterside views. They’re managed by the Woodland Trust. Just over in Kent, also check out Sissinghurst Castle Garden. In the area: As with Bateman’s (above) you’re very close to unpretentious fine dining restaurant The Curlew where the set lunch is a good value. Gastro pub The Bell at Ticehurst and self catering The Lodges at New House Farm are also nearby. 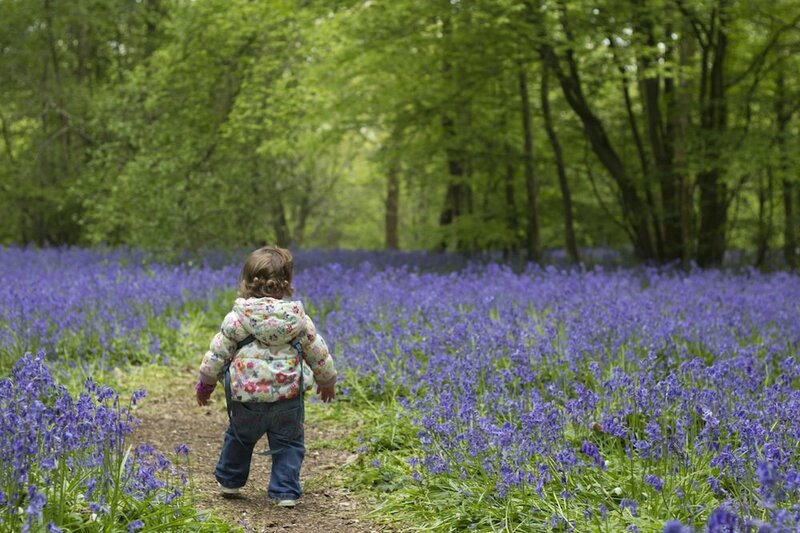 Forget tiptoeing through the tulips, how about running through bluebells? The annual Bluebell Trail run takes in beautiful scenery, with 10km or 10 mile options to try. The start and finish is at The Fox Pub, Patching where, for 2019, there’s a BBQ and children’s play area and free kids’ face painting. It sold out in early January for this year so keep an eye out for the 2020 event ticket launch if you’re up for it. For more suggestions see sussexwildlifetrust.org.uk. This is by no means a definitive list so if you have your own favourite bluebell spot please share.